I love doing environmental portraits. It is a challenge to create portraits that tell a story while also focusing on a person. 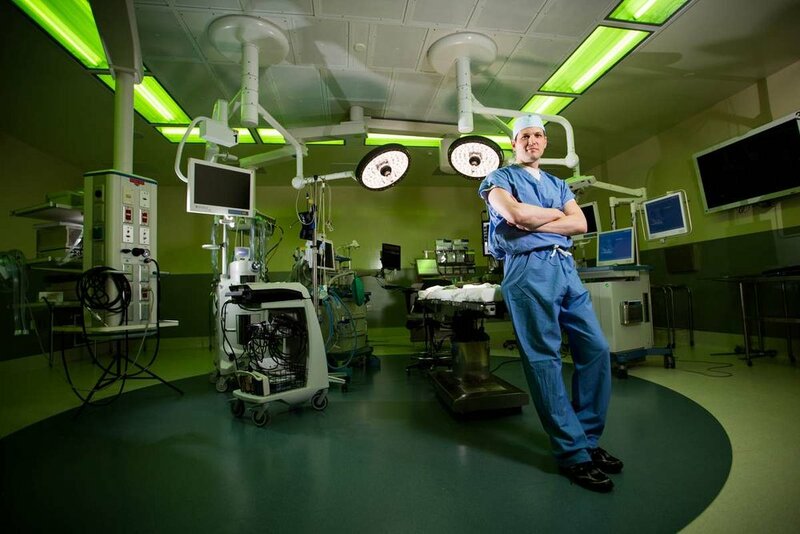 The idea with this one was to show the Doctor in his operating room while making the image engaging and interesting. The first step with an environmental portrait is choosing the space that will impart information about the subject. The operating room for this image was the obvious choice, and the scrubs made it look more natural. Another choice could have been to have him in the operating room with a suit, but that would have given the idea that this doctor was an administrator or in charge of other doctors rather than being the surgeon. It helped that this space was much larger than most so we could move some things around. The next step is to set up the space. For this one, I wanted basically all of the equipment to be in view. Again, this helps to tell the story of how complicated the job is with all of the different artifacts where the function of the objects may not be obvious to the viewer. Then, we get to the background lighting. This is usually a matter of using existing lights or adding lights that I brought with me. With this space, they had three unusual lights for me to use in addition to the normal room lighting. I turned off the overhead fluorescents. Then we turned on the green "contrast lighting" system. I thought this was very interesting. It using color theory to have the blood turn darker and the other types of tissue to turn lighter. Additionally, they had two spotlights that looked like some sort of alien spacecraft to me. Once the background is set, I decide on the exposure to create the tones and colors I want in the final exposure. My Canon 5D Mark III was set to 1/80 at f2.8 and ISO 100 with my 16-35mm lens at 16mm. I always set up the scene before I work with the subject. I work from back to front anytime I am shooting portraits. I placed my subject, Dr. Justin Klimisch, in the frame. Then, I started lighting him. After looking at the available light, I wanted to put a flash on him bright enough to drown out the green lights. I placed a small flash in softbox. It is just out of frame camera right at about a 45-degree angle to the subject. Once I had that in place, I wanted a bit more separation from him and the background. I placed a second flash zoomed in to create a smaller angle of light to hit him from the rear. If you look carefully, you can see the lightstand in the frame to the left beneath some equipment. I edited this out for the doctor, but for this article I left in there so you can see where the light was coming from. Both the flash units I added were set to manual so I could control the output of the flash and it would be consistent from frame to frame. I am very proud of this image. It was taken about six years ago and has gotten me numerous jobs doing similar work. Click here for more information about my mentorship program.